As everyone who knows me (www.ignacioalperin.com) knows, I am a maker of art and a lover of both art and music, particularly jazz and all its variations. I have always endeavored to put both artistic forms of expression together, looking to synthesize them into new creations. I have managed to do my own thing, but my love for the works of great geniouses like Kandinsky, Picasso, Van Koenig, Rauschenberg, and Pollock amongst others, will show through. In music, even though my tastes are usually expressed in terms of the great bebop and hard bop masters like Evans, Coltrane, Monk, Davis, Pepper, Bird, and the golden era of American voices like Ella, Sinatra, Bennett, Dinah Washington, and Nina Simone, I am quite eclectic. I love classical music, tango, blues, soul, hip-hop and I can find inspiration in almost any tune that I enjoy, no matter its style. Like I always say, music deserves a great deal of the credit in my art. “Inspiration is easy to find when you are perched on the shoulders of genius” is my usual response. As I slowly entered into the realm of object design and sculpture, music was also there to inspire me, to make me “see”. As many of you have seen, I recently introduced my latest piece at Art Deco, an Exhibition of intervened objects by well known Argentine artists, which took place at the Recoleta district in Buenos Aires in late April. My design is quite simple. An all crystal coffee table within which, just like a transparent jewel box, In which I placed a sculptural piece made up of more than 1800 Faber-Castell Goldfaber artistic pencils standing perpendicularly and making up a colorful and airy version of the painting that lurches beneath. It strikes me that every person, whether young or old, who has stood in front of the finished table ends up drawing out a big and happy smile. 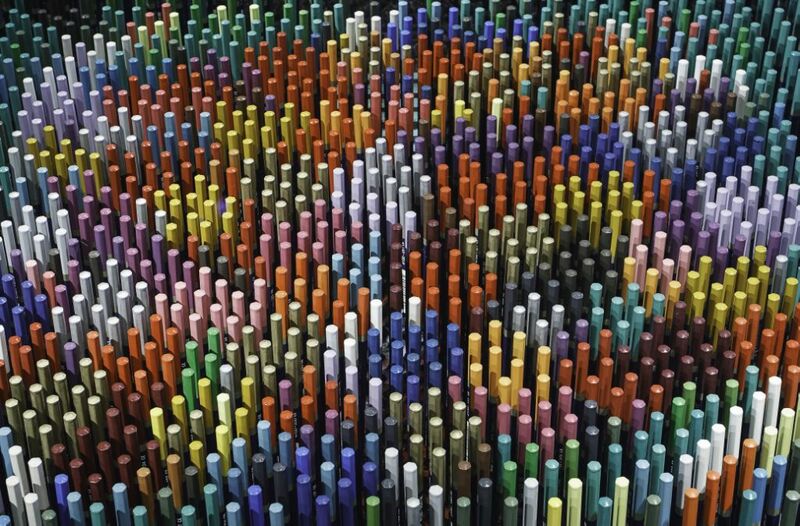 The color pencils create a link to something very familiar, something warm within each one of us, and initiate the communication with the viewer immediately. The idea of using pencils for this intervention came to me as I watched a Tony Bennett documentary a while back. I already had the crystal table and listening to that genius sing made me close my eyes, and suddenly I saw it. It was like a clear box full of candy, the idea of the beautiful color pencils used as objects d’art instead as of instruments was born. I know others have explored this avenue, but I think I have managed to make it both artistic and utilitarian, with a cool twist. I am happy with the results and with the reaction of the public. It has been a wonderful experience. And to me, it is important that my art also has that COOL factor. It is a style and it is a message. Art is not something rigid, stuck somewhere in an impregnable limbo. It is something to be enjoyed. My art is a message of fredom and cool, for all to enjoy, in any way they wish to enjoy it. And talking about cool, enjoy the images of my latest work while you listen to the new 60’s Jazz scene B&W video of Justin Timberlake’s latest (featuring Jay Z). It seems that JT, just like me, also likes doing his thing with a Suit & Tie. Painting accompanying the table in photos: “Let´s get away from it all” (2012) by Ignacio Alperin Bruvera, 100cm x 100cm.